The Spearwood Railway station is a long-forgotten part of Cockburn's heritage. In 1905, farmers in the Jandakot area succeeded in their quest for a railway line to be built from Fremantle to Jandakot, and the line was finished in 1906. 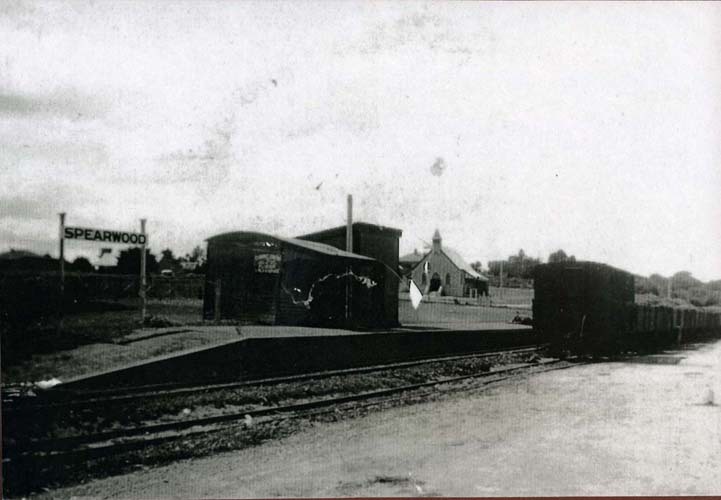 The first mentions of a railway station at Spearwood appear in 1909, when some of the buildings at the Jandakot station were moved to the Spearwood station. Trains ran once a day in each direction. The station was located at the intersection of Rockingham Road and the train line, where Goldsmith and Mell Roads meet Rockingham Road. It was little more than a raised wooden platform covered with dirt and a couple of wooden sheds. Although the line was closed to passengers in the 1950s, the nearby Watsonia factory could occasionally persuade the railway service to tack on a couple of extra carriages for special occasions. One Cockburn resident remembers catching the train from Spearwood to the Royal Show in the 1960s with all the factory workers and their families and friends. Passenger tours also ran along the line during the 1960s, although they didn't stop at the old stations. The old Fremantle-Jandakot Line is now the Fremantle-Forrestfield freight line, and all that is left of the Spearwood Station are a few wooden posts stuck in the dirt.